WHAT HAPPENED TO MICKEY ROURKE’S GIRLFRIEND? 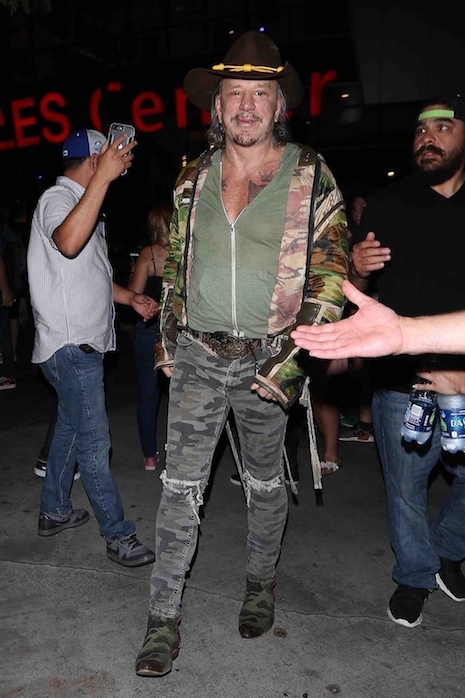 Mickey Rourke, 66, hasn’t been seen in public with his Russian model girlfriend Anastassija Makarenko, 32, for a couple of years. Mickey raved about her “I wouldn’t trade her for 20 Academy Awards – she’s a gift from heaven!” We always thought that considering his rampant eccentricities, Mickey was very lucky to have such a beautiful girlfriend. He has a history of insisting his girlfriends and wives stay at home while he carouses with male friends. Observers were surprised when Mickey brought a date to a party at Caffe Roma, where he usually hangs with his male pals. Paparazzi at the party identified Mickey’s date as his longtime girlfriend Anastassija and Mickey did not correct them. However, this woman is definitely NOT Anastassija because SHE is almost six feet tall! The question is: Who IS this and what happened to the REAL Anastassija? Ever since we met Brooklyn Beckham, 19, at Barneys, we’ve been interested in his evolving style and life. He was with the pretty and talkative actress Madison Beer at Barneys, and she fell in love with our Bedlington Terrier Elvis. Madison made a big fuss over Elvis and Brooklyn gave him some cuddles, but we were struck by his sweet manner. He was very receptive, but also amazingly polite. We were impressed. He was very patient with Madison, but she seemed a bit too exuberant and outgoing for him. (Brooklyn’s off and on girlfriend Chloe Grace Moretz, 21, is now living happily ever after in Malibu with model Kate Harrison!) Aspiring photographer Brooklyn is back in the UK, and he’s dating model Hana Cross, 21, – they were seen at the British Fashion Awards together. 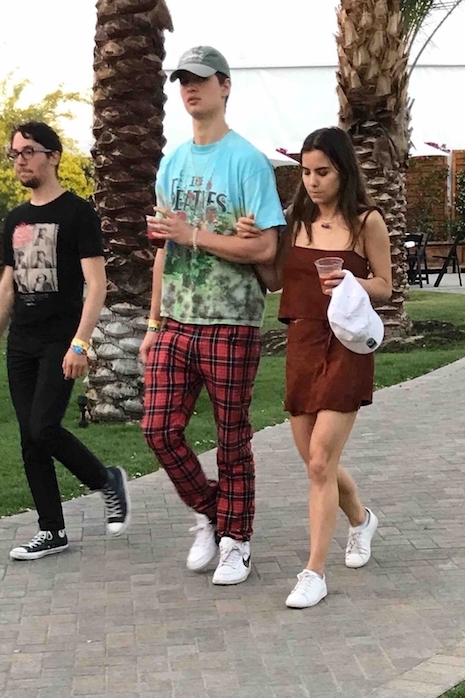 Baby Driver star Ansel Elgort, 24, and his longtime girlfriend Violetta Komyshan, 22, are just arriving at Coachella with drinks in hand. They’ve been together since high school! Both attended La Guardia performing arts school where Violetta studied ballet. In 2014 when Ansel’s career took off, he went a little nuts and they took a five month break. Eventually he got a grip on himself, and realized that he prefers a long–term relationship to random dating. Hard to believe, but he claims to be a one-woman man. ANOTHER model from the Gerber family is making quite a splash in Miami. The last time we saw Presley Gerber, 18, he was lip-locked with his blonde model girlfriend in New York. This week the Gerbers – Cindy Crawford and Randy and kids are all in Florida for a family vacation and Presley conveniently hooked up with another model – a suntanned brunette. These Gerber kids have quite a future ahead of them. 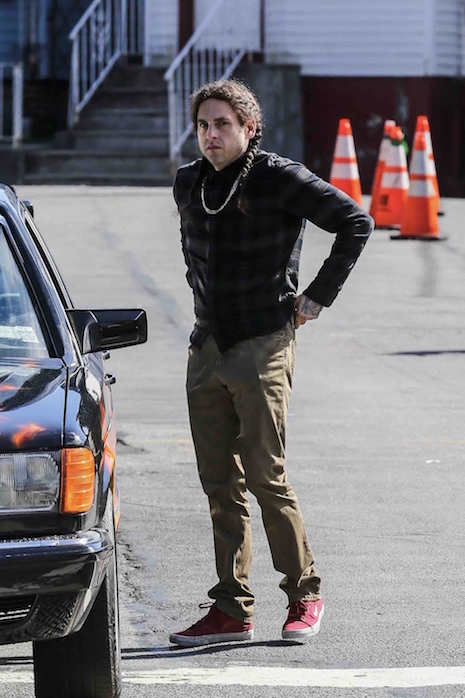 Jonah Hill has lost so much weight that his pants are falling down! And those BRAIDS! He’s in the middle of filming Maniac for Netflix- with Emma Stone. It’s the comedic story of two people in a mental institution and their fantasies. It’s funny how whenever Jonah loses weight, he also loses his girlfriend. (It’s been awhile since he’s been seen with anyone.) When he gains it back, they return. Young girls have been hip to Ansel Elgort, 23, for a while now, but until this weekend he could walk down the street relatively unnoticed (despite being 6’4”) Baby Driver opens this weekend and that’s going to change EVERYTHING. It’s a teenage dream movie – great music, cool cars, action galore, and even a sweet romance. Ansel’s provocative role is destined to launch him into stardom a la Jennifer Lawrence. The baby-faced actor does have a real-life girlfriend – his high school sweetheart, who happens to be a ballerina. Somehow that makes him even more appealing. Anyway, Baby Driver is a movie that’s hard not to like, even if you are NOT a fan of action, like us….